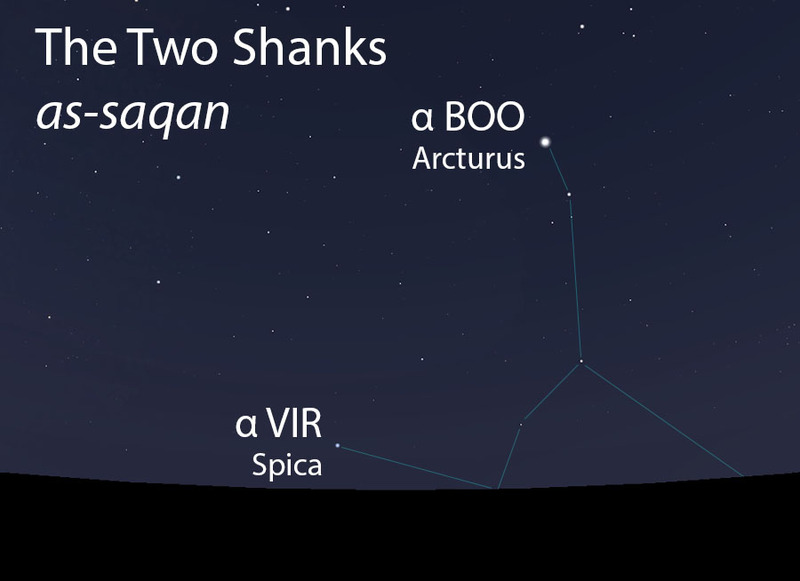 The Two Shanks (as-saqan) are part of the Arabian megaconstellation of the Lion (al-asad). They mark the eastern boundary of the Lion. 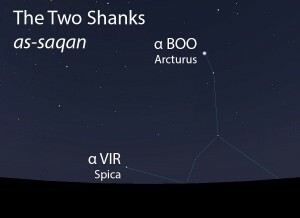 The Two Shanks (as-saqan) as they appear setting in the west about 45 minutes before sunrise in late April. Sky simulations made with Stellarium. The Two Shanks of the Lion do not figure in the calendar of the rains stars. However, as the Two Sky-Raisers, the setting of these same stars mark the short rainy season of summer (as-sayf). The Two Shanks of the Lion are not one of the lunar stations, but in early listings of the lunar stations, the Unarmed Sky-Raiser is the 14th station of the year. The Two Shanks are part of the Lion (al-asad, الأسد) folkloric celestial complex, which extends from the Two Forearms (adh-dhira’an, الذراعان) to these Two Shanks.